The Very Best Branding? It's Personal! - Go Creative Go! The Very Best Branding? It’s Personal! When it comes to running a successful business, I’m of the mind that the more personal your branding, the better? Watch any cutthroat big business flick and you’ll hear some iteration of the italicized phrase above. For some reason, the only one that comes to mind right now is not so cutthroat, as it’s a rom-com, You’ve Got Mail. LOL! Personal branding. It’s one of those very buzzworthy, ever-so-clickable phrases we see scattered quite often through our social media feeds. 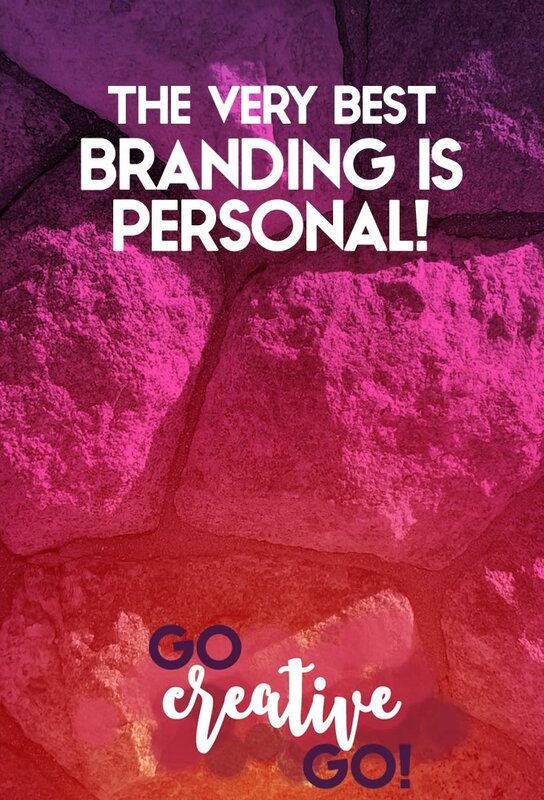 All Brands Are Personal Brands! Brands aren’t just big business anymore. Even when a brand is built around a company, it’s got to be personal. The better the brand, the more they understand this. Why? Because consumers do business with PEOPLE they know, like and trust. When real people are seen as part of a brand, it’s easier to build and maintain that knowledge, affinity and trust. The best brands maintain a personal relationship with audience and clientele, individually and as a whole. Making a personal connection amidst all the marketing noise is a must in order to stand out and stay on message. Branding must personalize the experience for consumers and prospects? Consider this, what do you want a potential prospect to remember upon hearing/seeing your name? You want them to feel a connection to you, your company, your brand. You want any reaction upon hearing/seeing your name or company name to be positive. You hope that when a friend, co-worker or acquaintance mentions a product or service need, those that know your brand will readily share with whomever is doing the asking. Is your brand message cohesive across all digital real estate? This means your web site and all of your social accounts. Do you effectively and actively engage in discussion and conversation with your consumer audience online? Do you respond to comments on your blog, queries on your Facebook page and quick questions on Twitter? Do the images you share match your brand message in tone and appeal? Do you continue the conversation after the initial question is answered or discussion is over? Do you look at and possibly share or comment on what your followers are posting? Do you check back in to see if all’s still well a day later? A week later? Beyond? When your brand makes a personal connection with a prospect – another person, by the way, you’re more inclined to make a sale, or, at the very least, warm up a cold lead. First impressions are incredibly important, especially online. If your brand comes across as robotic or automated in its online interactions, you might not get a second chance to make a good first impression. There are plenty of other brands who’ll get it right the first time. Not sure if your brand’s actively connecting with prospects and current customers on a personal level? Give us a shout. We can set up a consultation or complete an interaction audit. Smart Search Skills Make Stock Photo Selection Stellar! Which Came First, The Content Or The Marketing?